Bob's Burgers isn't the most innovative show, but at least they manage to do some storylines that are out of the ordinary and interesting. Having three mini-stories with a common theme isn't new, and in this case, it isn't even great, but at least it was different. Tina going from begging to get an invitation to a party to posing as its star was equally amusing and ridiculous. I think that they could have done more with Tina being a rebel and hanging out with boys while her parents are out of town, though. Why not stray slightly from every other plotline that has ever depicted this situation before? However, going too far doesn't work, either, as I had a tough time buying most of what happened while the kids were on the wine train! 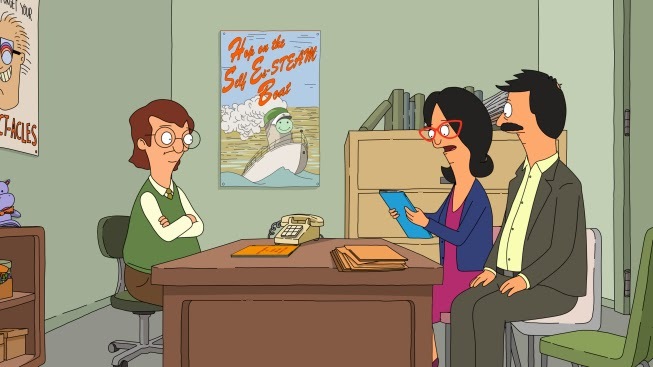 Bob's Burgers "The Frond Files" (S4E12): Bob and Linda go to school night where they can't find Tina's, Louise's, and Gene's projects. Turns out, their essays were so creative that they were offensive, so they're hidden.